50:50 chance, but is it classical or quantum? All unpredictability in the world around us, be it the outcome of a coin flip or the weather conditions a month from now, is a fundamentally quantum rather than classical phenomenon. This is the conclusion of two physicists in the US, who have worked out that molecular interactions in gases and liquids can amplify tiny quantum fluctuations, to the point where the fluctuations are large enough to account for the uncertainties we experience at the macroscopic scale. This insight, they argue, could prove important in cosmology, as it might rule out some theories of the multiverse that rely on classical as opposed to quantum probabilities. In classical theories of probability the chances we attribute to a flipped coin landing either heads-up or tails-up simply reflect how much or how little we know about the coin flipping. To say that there is a 50:50 chance means we have no idea how the coin will land. 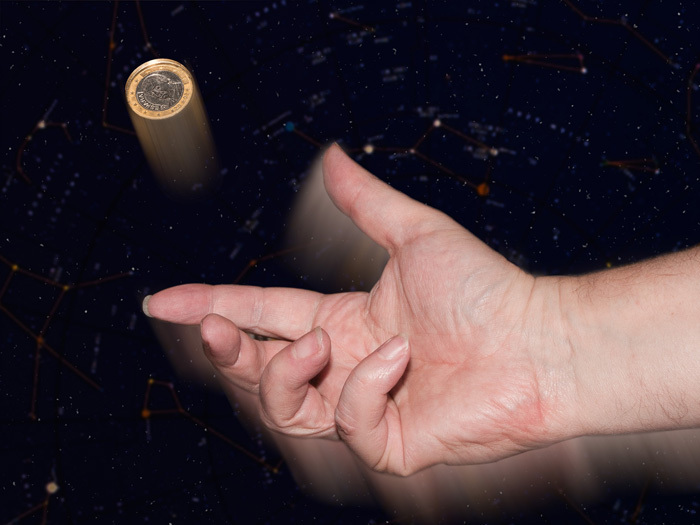 In principle, however, if we understood exactly which physical processes determine the outcome of the flip and also know with enough precision all of the relevant parameters – such as the force imparted to the coin, the height at which it lands and the air resistance – we could predict the outcome with certainty. According to the latest research, this view is not correct. Andreas Albrecht and Daniel Phillips of the University of California at Davis argue that the probabilities we use in our everyday lives and in science do not "quantify our ignorance" but instead reflect the inherently random nature of the physical world as described by quantum mechanics. They maintain that quantum fluctuations can be amplified sufficiently by known physical processes to the point where they can entirely account for the outcome of these everyday macroscopic events. In fact, they claim that all practically useful probabilities can be accounted for in this way. In other words, all classical probabilities can be reduced to quantum ones. To back up their case Albrecht and Phillips consider an idealized fluid of billiard-ball-like molecules that continually collide with one another. The Heisenberg uncertainty principle dictates that the trajectory of a billiard ball will have an inherent uncertainty, resulting from the uncertainties in its position and momentum. The researchers worked out – by inputting suitable values of radius, mean free path, average speed and mass of the billiard balls into a couple of simple equations – how much this uncertainty grows with each collision between the balls. They show that in water and air (nitrogen) the uncertainty becomes so large in the space of one collision that every single fluctuation in the properties of these fluids has a fully quantum-mechanical origin. The researchers then show that the quantum fluctuations manifest in the water can wholly determine the outcome of a coin flip. They calculate that a typical flipped coin can spin through half a revolution in about 1 ms. This is also the temporal uncertainty in the neuronal process governing the coin flipping, a process that a group of neuroscientists in 2008 argued is caused by fluctuations in the number of open neuron ion channels. Since these fluctuations are, in turn, caused by the Brownian motion of molecules called polypeptides in a fluid that is largely water, quantum uncertainty (which drives the Brownian motion) can completely randomize the coin flipping. As such, the researchers say that anyone tossing a coin is, in fact, performing a Schrödinger's cat style experiment. But rather than a cat that is both alive and dead, the quantum object in this case is a coin, the final state of which is simultaneously heads and tails. The outcome of the flip therefore remains genuinely open until the upwards face of the coin is looked at, at which point the system takes on a definite value of either heads or tails. The researchers admit that their example is very simplified and that they would have a hard job tracing the amplification of quantum uncertainties in all familiar contexts, be it rolling dice or picking out a card at random. They also point out that it would only take one counterexample to falsify their idea – a use of classical probabilities that is clearly isolated from the physical, quantum world. David Papineau, a philosopher at King's College London, believes that Albrecht and Phillips are likely to be correct but he doesn't think their conclusion is terribly surprising. "It is very likely that all serious probabilities, be it a coin landing heads-up or a child being female, are manifestations of quantum chanciness," he says. "Indeed we have devices, such as Geiger counters, that show how big results are often caused by chancy micro-events." Albrecht replies that he and Phillips are perhaps the first physicists to have tackled the relationship of quantum and classical probabilities head-on, and he argues that the latest research might also rule out some theories in which physical processes (such as "eternal inflation") produce multiple copies of pocket universes like the one we observe around us. Such theories of the "multiverse", he says, need to import purely classical probabilities because a quantum wave function on its own cannot determine in which universe a particular measurement would be made. But Albrecht points out that such a move would not be possible if classical probabilities are, at root, quantum. A preprint of the research is available on arXiv.